Simplify Your Home Entertainment With Logitech!! If you like to keep up with all the latest and greatest gadgets that help simplify all of your entertainment needs, then look no further. The Logitech Harmony Elite Remote unifies control of your expanding universe of home entertainment and smart home devices into one powerful yet effortless experience. Before I had this remote here’s what I had to do in order to watch TV. 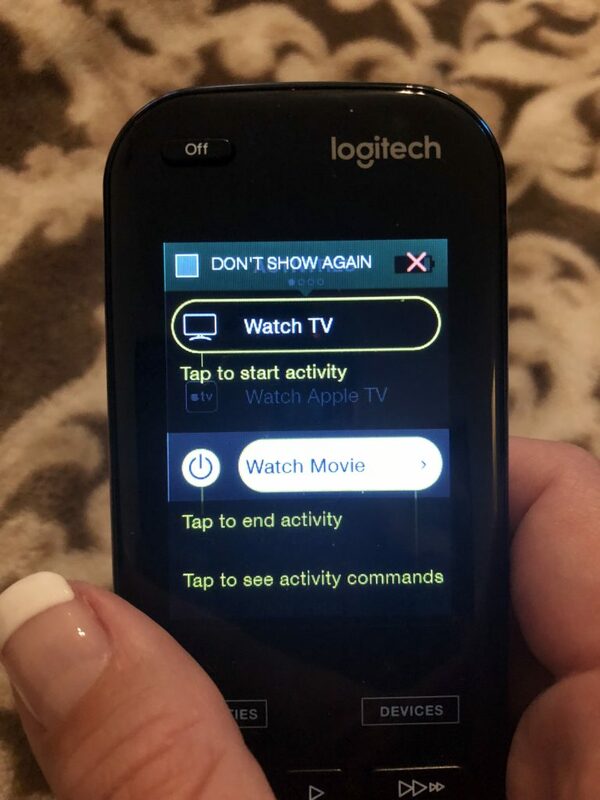 First I had to turn on the TV with my LG remote, then I had to turn on the soundbar with the smaller Samsung remote, and finally I had to use another remote for the cable box to navigate channels. And that’s just for watching cable, if I wanted to watch a Blu Ray DVD then I would need to use yet another remote. The Logitech Harmony Elite remote can replace up to 15 remotes so say goodbye to that jumble of remotes once and for all. 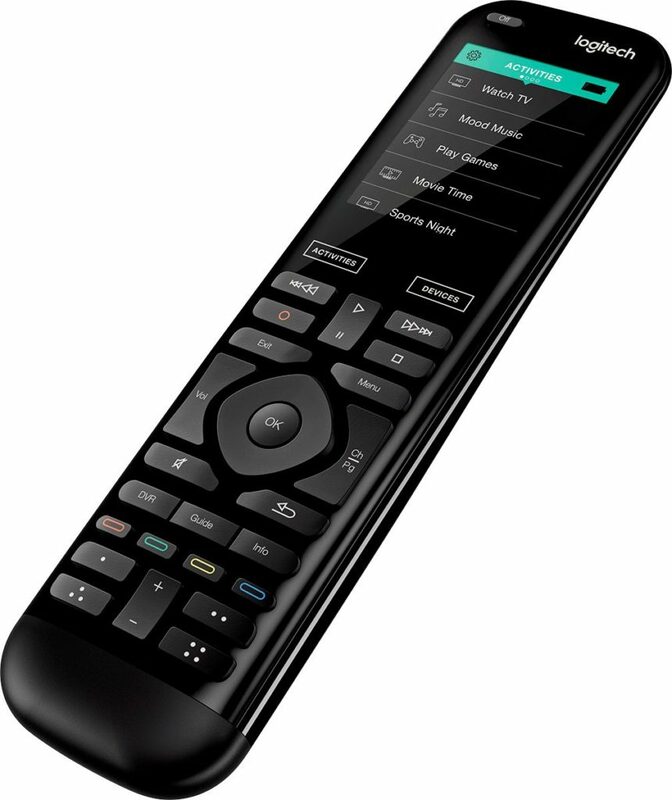 Harmony remote controls let you combine your old remotes into one advanced universal remote that works with more than 270,000 devices from more than 6,000 brands. But that is just the tip of the iceberg, Harmony Activities let you control multiple devices as one. Press Watch TV and the right devices power on and automatically switch to the right settings / input. Channel buttons control the cable box while volume buttons control your AV settings. The Harmony Hub, included with Harmony Elite and Harmony Home Control remotes, gives you control over devices hidden inside closed cabinets or behind walls , whether you’re using the remote or Harmony app. You can also adjust devices when you’re away from home using your iOS or Android smartphone or tablet. The remote itself is sleekly designed featuring a color touchscreen with motion-sensing backlit keys and one touch automation. It has a comfortable design for easy handling. The remote also comes with a charging station and has a rechargeable battery pack which provides reliable operation. No more desperately trying to find two AA batteries hoping they haven’t already been used up. It has a very simple online set up for PC and Mac and is compatible with Windows 7, 8, or 10 or Mac OS X 10.7 or later with an Intel processor. 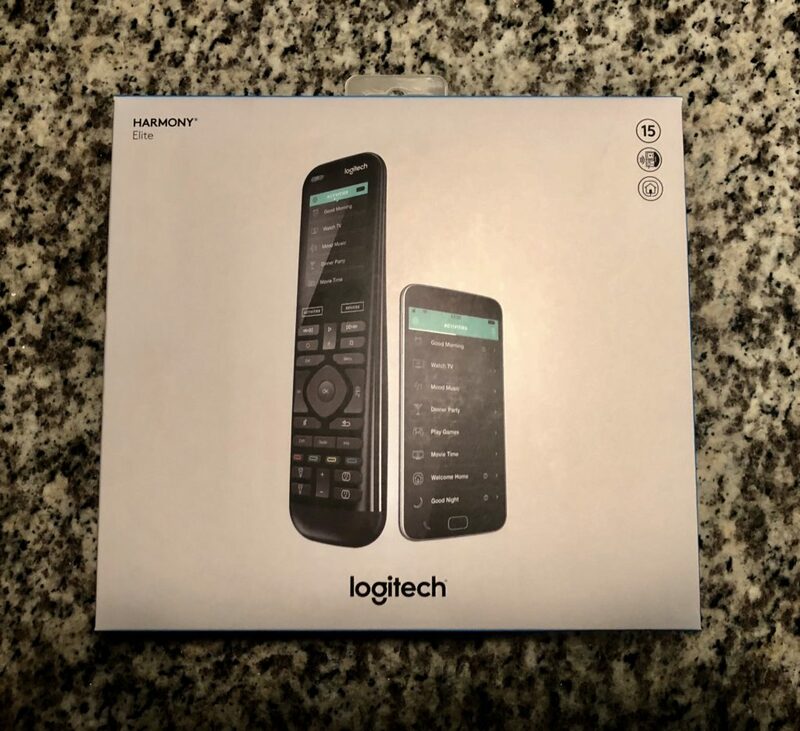 Included in the Logitech Harmony Elite Remote box is the Harmony Elite Universal Remote, Harmony Hub, charging station, two IR mini-blasters, USB cable, 2 AC adapters, and the owner’s manual. But I saved for the best part for last. The Logitech Harmony Elite Remote makes a great companion with Amazon Alexa or Google Home. With the Harmony Elite Remote and Amazon Alexa you can control your entire home entertainment experience with just your voice. Turn on your TV, change channels up or down, fire up a playlist or set the mood for movie night. Harmony Elite and Alexa let you start your favoirte activities no matter what they are. Start an activity like “Sports Night” to turn on ESPN, dim the smart lights and even crank up the subwoofer to make it feel like your practically at the game. When it’s time to switch gears and turn on “Date Night”, just say the word and it will automatically switch inputs to your Roku home menu where you can select Netflix or Amazon Prime. But my favorite activity would have to be “Game Time” which turns on my TV, PS4 and surround sound, brightens my Philips Hue smart lights that creates an aura behind the TV, and even sets my Nest Learning thermostat to a cool 70 degrees so I can comfortably play God of War or FIFA World Cup in peace while being fully submerged in the experience. Did I mention that the Harmony Elite works with over 270,000 entertainment and smart home devices so you can enjoy single-touch control with your favorite brands, right out of the box? From your TV, cable and gaming console, to your AV receiver and Roku media player- all the way your smart lights, locks, thermostats, even your Alexa- Harmony Elite proudly works with just about everything. Go check out your local Best Buy to find this amazing device along with all of your other home entertainment needs! Don’t delay, pick up the Logitech Harmony Elite Universal Remote and leave the chaos of multiple apps and remotes behind, and let peace reign supreme!